Looking for engaging, appealing and informative science-themed and technology-themed books that incorporate traditional knowledge? Look no further than Inhabit Media. 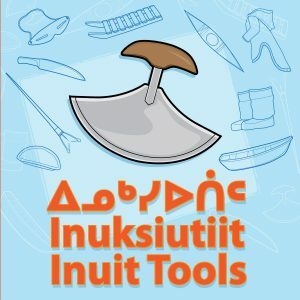 Inhabit Media, an Inuit-owned publishing house based in Iqaluit and Toronto, aims to “promote and preserve the stories, knowledge and talent of northern Canada.” The company publishes a wide range of books for adults and kids, plus two magazines: Kaakuluk: Nunavut’s Discovery Magazine for Kids and Pivut: The Magazine for Nunavut Youth. With an author list that includes established and emerging Northern writers and elders, as well as knowledgeable Southerners, Inhabit offers readers a rich variety -- from board books on Inuit tools and clothes to informational picture books to YA novels, historical and contemporary. 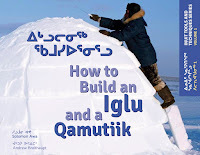 Publishing in English, French, Inuktitut and sometimes Inuinnaqtun, Inhabit works to ensure that its books are accessible to both Northern and Southern readers. A recent success for the company has been the Animals Illustrated series for readers aged 4 to 6. Each book is a lively mix of animals facts and first-hand accounts from authors who live in the Arctic, accompanied by meticulous and appealing illustrations. There are now four books in the series, covering polar bears, narwhals, muskox and walruses. A fifth book, on bowhead whales, is coming this fall. 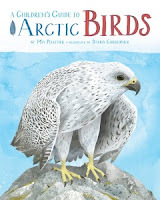 One of my personal favourites in Inhabit’s list is A Children’s Guide to Arctic Birds (2014), written by Mia Pelletier and illustrated by Danny Christopher (for ages 4 to 6). Informative, accurate and with gorgeous illustrations, the book looks at 12 birds that make the Arctic their permanent or seasonal home. 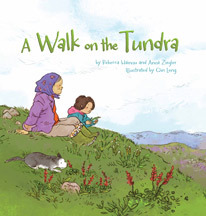 Another favourite is A Walk on the Tundra (2011) written by Anna Ziegler and Rebecca Hainnu and illustrated by Qin Leng (for ages 6 to 8). This is a picture book story that features a warm intergenerational relationship while incorporating a great deal of traditional knowledge. Innuujaq reluctantly accompanies her grandmother on a walk to pick Arctic plants. Through it, she learns a few things about her grandmother and much about tasty, nourishing and medicinal plants. 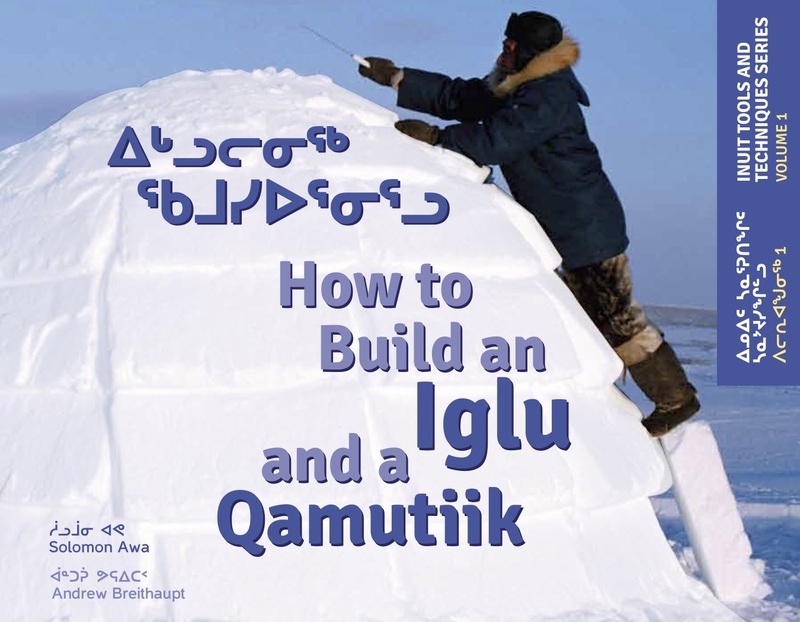 Included at the end are scientific descriptions of the plants, photographs and a glossary of Inuktitut words and phrases. More recently, Ziegler, Hainnu and Leng collaborated on A Walk on the Shoreline (2015). Discover your own favourites among Inhabit’s books at www.inhabitmedia.com! Canada's next Governor General - out of this world! Literally, she was out of this world. Twice! Julie Payette, who will take up the post of Governor General of Canada in the fall, is a scientist, an astronaut, and the first Canadian woman to board the International Space Station (ISS). 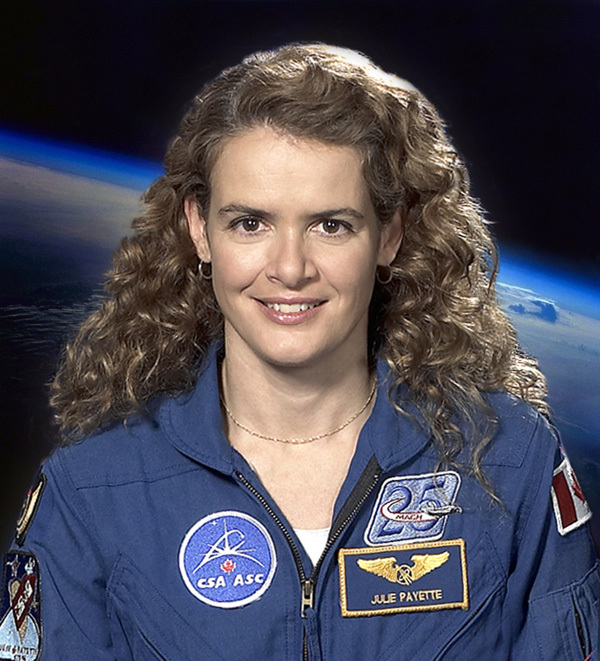 Julie Payette. Canadian Space Agency photo. In fact, she helped build it. In 1999, she spent nine days as part of the second mission ever to the ISS. In a 2015 interview with Macleans Magazine, she said she thought of herself as a space construction worker. "We brought the first three tons of equipment, including some of the Imax camera stuff. We literally switched the light on to the station and walked in." In 2009, Payette left Earth again, this time as flight engineer aboard the space shuttle. During that trip, she got to manipulate the giant, Canadian-designed robotic arms on the shuttle and the space station - Canadarm and Canadarm2. It was a tense assignment, she said in the Macleans interview: "When you're moving something on a a multi-billion-dollar structure, with people on board who count on that structure for safety and integrity, a mistake is not an option." Payette has degrees in electrical engineering and computer science. She holds a commercial pilot's licence and is also a qualified pilot of military jet aircraft. She speaks English and French fluently, and can also carry on a conversation in Russian, Italian, Spanish, and German. And if that's not enough, she plays piano and has sung with several major classical music groups. The 53-year-old Payette retired from the Canadian Space Agency in 2013, and became chief operating officer of the Montreal Science Centre. She left that job recently and will be sworn in as Governor General probably in late September or early October. As the representative of the Crown in Canada, the Governor General performs the Queen's duties as set out in the Canadian constitution. It is a largely ceremonial role, but offers the person performing it plenty of opportunity to interact with Canadians in all regions and at all levels. Most recent governors general have used the opportunity to bring attention to an aspect of Canadian life that they feel strongly about. In an interview with the Globe and Mail, Payette said it's still too early to say what her priorities will be during her tenure, but that they will include science and a knowledge-based society. As both a scientist and a science communicator, she is admirably equipped to take on that task. Buck, Genna. "What's the scariest part about being in space?" Macleans, 20 August 2015. Leblanc, Daniel. "Julie Payette says being governor-general a chance to serve Canada 'on Earth'." Globe and Mail, 13 July 2017. Biography of Julie Payette. Canadian Space Agency, 10 September 2013. The Canadian Press. "Former astronaut Julie Payette will be Canada's next Governor General." The Star, 13 July 2017. One of the coolest things about fiction (especially science fiction) is how it inspires scientific discovery in real life. Cell phones - inspired by Star Trek communicators - are a classic example. Edmond Locard is another. Locard was a huge fan of Sherlock Holmes novels, in which the great detective solves crimes using the tiniest of clues. The books were one of the reasons that Locard became a forensic scientist. He not only pioneered the field of trace evidence - microscopic clues - but defined Locard's Principle, "every contact leaves a trace." Meaning that during a crime, physical evidence transfers between the crime scene and the criminal, this Principle the cornerstone of modern forensics. One of my favourite examples is a case where science inspired art which then turned around and inspired science. It began during the Scientific Revolution - the era of scientists like Newton and Boyle (who, in addition to defining Boyle's Law, invented the lab report). During a frog dissection around 1780, Luigi Galvani's assistant touched a nerve cell with his scalpel, and the frog's leg jumped. Galvani believed nerve cells conducted electricity - could electricity be the spark of life? Electric shocks couldn't save drowning victims, but they did cause the corpse of a murderer at Newgate Prison to sit straight up. Mary Shelley was well-educated and fascinated by science, so she probably knew about these experiments. So it's probably not surprising that, when a group of her friends challenged each other to write scary stories, she came up with Frankenstein. In the early 1930s - golden age of Hollywood monster movies - 9-year-old Earl Bakken saw Frankenstein for the first time. He loved it so much, he went back over and over again, fascinated by the way electricity brought dead tissue back to life. Bakken also loved to tinker with mechanical devices, and once he got his engineering degree, opened a medical technology company in his garage. He repaired equipment for the local hospital and made friends with a lot of the staff, including Dr. Wilton Lillehei. Lillehei was a pioneer in the field of open heart surgery. After the procedures, about 10% of the patients, many children, needed pacemakers to keep their hearts beating until they healed enough to beat on their own. At the time, pacemakers were so big, they had to be pushed around on carts. They also had to be plugged into the wall. As a result, one of Lillehei's child patients died during a power outage in 1957. Lillehei asked Bakken to come up with something better. Bakken designed a 4 inch square, wearable pacemaker powered by a 9 volt battery. Bakken tested it on a dog and the very next day, Lillehei connected the wires to a little girl's heart. She not only survived the surgery, her heart grew strong enough that she didn't need the device anymore. Today, Bakken's company, Medtronic, is the largest manufacturer of (implantable) pacemakers in the world. 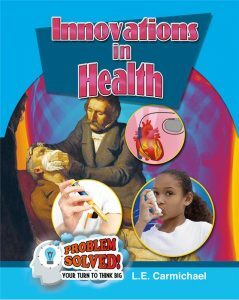 For more cool stories about medical innovations, check out my children's book, Innovations in Health. 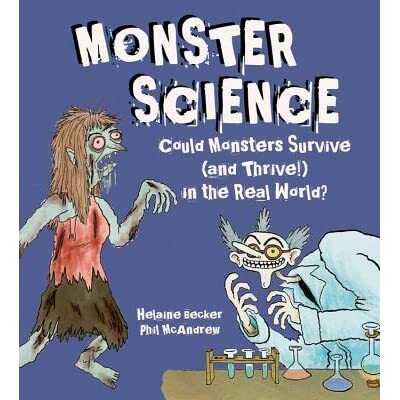 And for more on Frankenstein, vampires, werewolves, and sea monsters, check out Monster Science, by Sci/Why blogger Helaine Becker. In advertising and in popular writing, especially about health concerns, chemical is used to mean harmful. As science writers and science-literate people, we know that chemical isn’t a synonym for harmful. 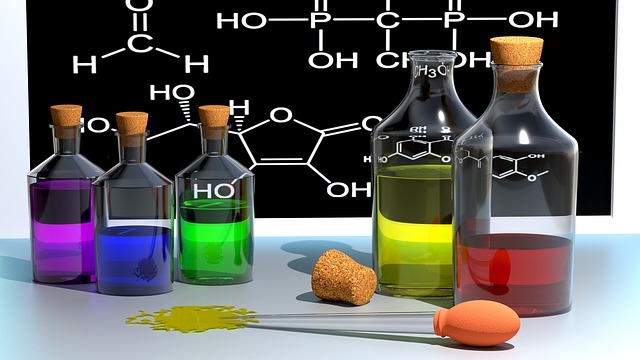 Not all chemicals are harmful, and besides, everything is a chemical. So how can we, as science communicators, help readers understand the message by using more accurate language? Some chemicals are good and some are harmful. And some are good because they are harmful. Think of chlorine bleach, for example. It is deadly in large doses, and that’s what makes it useful for disinfecting drinking water. Chlorine bleach (sodium hypochlorite) is an artificial chemical. There is a common perception that artificial or manufactured chemicals are more toxic than natural ones. You don’t have to look beyond the periodic table to find natural chemicals (or elements, in this case) that are highly toxic: lead, plutonium, and mercury, for example. Yes, natural substances are chemicals. Everything is a chemical! Water is dihydrogen oxide and salt is sodium chloride. The difference between an artificial chemical and a natural one is that the natural one can be found in nature, without anyone making it. Of course they know that these natural things are quite harmful to some people. But they’ve gotten caught up in some rhetoric and need a little nudge to remember the truth they know. Even arsenic is a natural chemical. It’s made in Earth’s crust and often makes its way to the surface because of mining operations. Arsenic is a deadly natural chemical. So is the botulism toxin. In fact, botulism is more than a million times more toxic than arsenic. What! Enter the grey area: chemicals we find in nature but that are manufactured in larger quantities than it would be reasonable to get from the natural sources. Vitamin C comes to mind. So does alcohol. Most synthetics are chemically identical to the natural form. When we are writing or editing, let’s steer toward using terms that promote a better understanding of science, and of the world around us. Avoid using chemical when synthetic or harmful are the intended meaning.